Learning how to use reverb is an essential mixing skill. Time-based effects have the ability to add width and dimension to your mix, and give instruments their own sonic space. Reverb is often used to push mix elements further back, but it can also be used to bring sounds forward. Honing your reverb mixing skills will ensure you don’t overdo it and end up with a washy, muddy mix! One of the quickest and easiest ways to clean up your reverb mixing is to insert an EQ after your reverb plugin. Full-frequency reverbs eat up a lot of space in the mix, because you’re essentially doubling up on an instrument. Rolling off both the high and low ends means you’ve removed unnecessary frequencies that will clash with the rest of the mix. Depending on the instrument, a good place to start is with a high pass filter around 600 Hz and a low pass filter around 7 kHz. Again, depending on the instrument and the desired quality, you might try opening those up or even pinching them tighter. The primary goal is to eliminate unwanted low and high ends that quickly muddy things up. 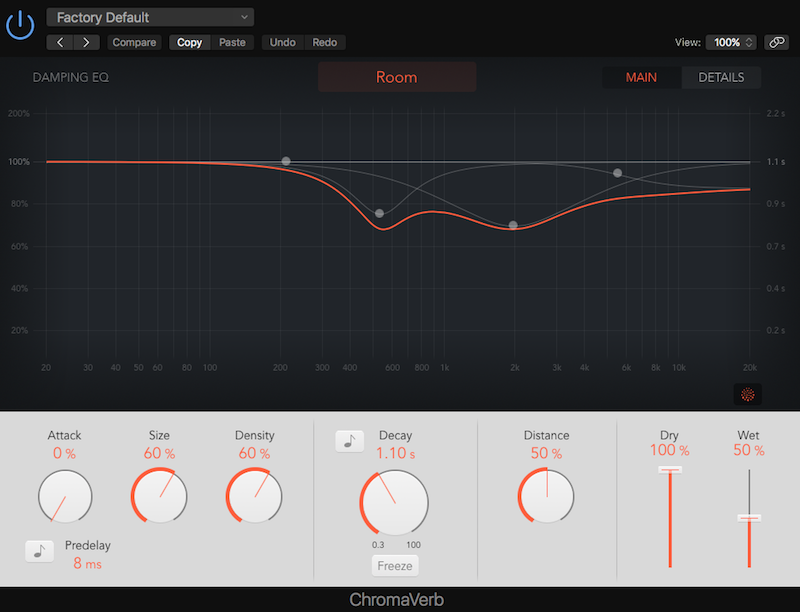 Another great trick to experiment with is panning your reverb returns. Instead of using a stereo reverb, try a mono one and pan it opposite the instrument you’re sending to it. This works especially well on double-tracked instruments like electric guitar. You can pan the left guitar’s reverb right and the right guitar’s reverb left for a lot more width and dimension. This is a cool trick for making your snare reverb sound cleaner and more consistent from hit to hit. When you trigger the snare reverb from a sample, you don’t have to worry about adding unwanted reverb to the hi-hat or other instruments that were also picked up by the snare mic. You can even use this trick to trigger the reverb, and keep the snare sample muted and out of your mix, by sending the sample to the reverb send pre-fader and muting the sample. This works well if you want to use your live snare drum and not blend a sample in to the final mix! Why have one reverb on your vocal when you can have 2, or even 3?! It’s quite common to blend 2 or 3 reverbs on a vocal, and then automate the output of those reverbs to create the blend that I want at different parts of the songs. Blending multiple reverbs can sound more interesting than just using one, and adding automation to them can keep them from sounding static and stale by the time you get to the end of the mix. In my go-to Pro Tools template, I have 4—yes, 4—reverb sends on my vocal tracks, all ready to go when I need them. My chamber, hall, room, and plate reverb returns are all set up (and EQ-ed!) so I can focus on getting my vocal mix up efficiently. It isn’t uncommon at all to use a little bit of several reverbs rather than a lot of one. Trust your ears and experiment! This is a good reverb mixing trick to keep it from sounding too washy while the singer is singing. Insert a compressor after your reverb on its return, and insert the vocal in the compressor’s sidechain. When the vocalist is singing, the compressor will turn the reverb down for you, and when the vocalist stops, the compressor will let the reverb come up slowly. Adjusting the release time will determine how quickly the reverb swells in after the vocalist finishes a line. We’ve sort of set up a theme of vocal reverb tricks here, so for the fake of demonstrating how to use reverse reverb, we’ll use vocal tracks as an example!